On solid ground In Far North Queensland the Hope Vale community is investing in home ownership. Taking the lead Melanie Lavelle-Maloney is empowering others to be their own success story. The new voices Students Connor Diffey and Breeana Gregory discuss their experience as interns at IBA. Field of dreams Community spirit has given a Toowoomba sports complex a new lease of life. A life by design We revisit the McGinness family, who are achieving each of their economic dreams. It's a RAP How might a Reconciliation Action Plan enhance your organisation? Building on trust Introducing IBA's new Indigenous Real Estate Investment Trust. 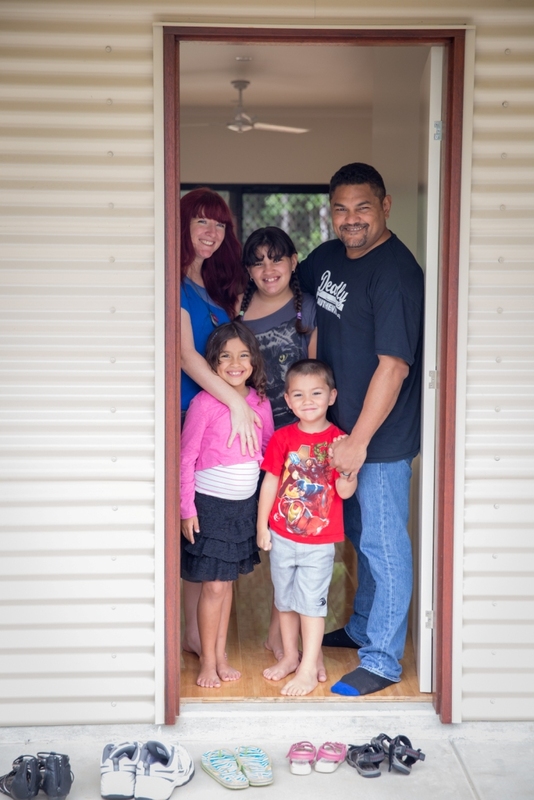 Wayne and Lucy McGinness and their children at their newly constructed home in Far North Queensland. You may remember reading about Wayne and Lucy McGinness in issue nine of Inspire (‘Hot Property’). The couple established their business Aboriginal Steel Art in 2008, and have steadily grown it with assistance from IBA’s Business Development and Assistance Program. Wayne creates original Aboriginal steel artworks, including functional pieces – fence panels, gates and balustrades – one-off, fine art sculptures, and a range of corporate gifts. Wayne and Lucy McGinness have created a charmed life for themselves and their family. Their business is going from strength to strength, with a flood of new commissions and increasing recognition from the corporate world. In addition to their successful business, Wayne and Lucy have recently finished building a new home in Kuranda, near Cairns in FNQ. Their three children are excited about their new home and have already staked their claims on the bedrooms. The big garden with its lush leafy surrounds is great for playtime and also big enough for Wayne to have a workshop, meaning he can stay close to home and his adored family while he works. The couple’s diligence, thoughtful planning and faith in each other is certainly paying off. Wayne and Lucy always planned to buy a home after they moved to Queensland from Darwin to start the business but were waiting for the right time. They were already well aware of the benefits of home ownership. The couple applied for a construction home loan through the IBA Indigenous Home Ownership program in 2013 and decided to construct their dream home. ‘We were looking at our options and found something we could afford’, said Wayne. ‘We actually pay only an extra $20 a week on the mortgage than we were paying on rent. ‘Of course there are extra costs like rates and insurance’, said Lucy. ‘but when it’s your own home you don’t mind spending that money. It’s your home; you are investing in your future’. ‘To get our income back to a level where we could borrow money, we needed the business to be doing well,’ added Wayne. ‘IBA’s support helped us get to the point where we could borrow the money to build our own home. It’s been an easy process with IBA; they really feel like family now’. Building their own home was the ideal option for the family’s specific needs, such as Wayne’s workshop. Although the workshop build was not covered as part of the IBA home loan, they were able to fund this through their business. ‘We really needed the space,’ said Wayne. ‘The grinding is noisy, so being on at least an acre provides a good buffer for neighbours’. ‘Having the workshop so close helps with our home life as well’, said Lucy. ‘Sometimes, Wayne will stop at 3.30pm when the kids get off the bus and then go back to work at 5pm. He couldn’t do that if he was in Cairns, commuting to a workshop’. At Aboriginal Steel Art Wayne McGinness creates unique Aboriginal artworks using marine grade style. When they started Aboriginal Steel Art (external website, new window), Lucy kept her full-time job in real estate so that they had a steady income and didn’t put “all our financial eggs in one basket”. In time, she reduced her hours to three days a week so that she could work two days on the business with Wayne. Now that Aboriginal Steel Art is flourishing and bringing in new commissions, Lucy has resigned from her job to work in the business full time. ‘At the end of the year, I was quite run down – I was being pulled in too many different directions and couldn’t give 100 per cent to anything’, said Lucy. ‘Thinking about and planning the house also took up a lot of time. Now that it’s done, we can concentrate on the business again’. Lucy keeps track of the orders and manages the company administration, as well as meeting clients and maintaining relationships. This allows Wayne to focus on designing and fabricating the steel pieces. At the time of our interview, Wayne was working on an interesting commission to create a large ceiling installation for an exclusive apartment development. Orders for corporate gifts, awards and trophies are also plentiful and the couple have a plethora of plans in the pipeline. ‘I wake up early in morning and have so many ideas’, said Wayne. ‘But they all have to wait their turn. It’s great that we’re so busy, being self-employed though’, added Lucy. ‘Being busy means the company is working’. Wayne hopes to collaborate with his friend and well-known Aboriginal artist Wayne Quilliam later this year. ‘I want to create something that blows people away’, he said. ‘Watch this space because it’s really going to be something’. The couple has two further goals for 2014: to create a lifestyle range, including home wares and garden art, and to develop new architectural opportunities for the business. At the end of 2013, Wayne and Lucy visited San Antonio, Texas as part of the Supply Nation delegation to the NMSDC Business Opportunity Fair, aimed at building supplier diversity networks and opportunities. While they were there, the couple met the head of the Minority Business Development Agency, David Hinsen, who advises President Obama about minority suppliers. By their own admission, it was a “mind blowing moment”. ‘It was the best networking opportunity; how would we get to speak to him otherwise?’, said Wayne. ‘If we weren’t over there for the delegation, we would never have met him’. ‘He was amazing and so confident that our ideas would work’, said Lucy. ‘He said to us: “just do it”. The couple acknowledge IBA and Supply Nation in assisting them to make contacts and create opportunities that have helped their business grow, as well as Fortis One – their business mentors – who have been instrumental in helping guide the business. ‘There’s no doubt that if we didn’t know IBA, Fortis One and Supply Nation, we would not be where we are today’, said Wayne. ‘But you need something to bring to the table in first place. You need necessary skills and the drive to put the hard yards in’. It’s certainly a credit to their hard work and determination that Wayne and Lucy are now at a point where their business and home life complement each other. And while their workshop and their home are full of spectacular artistic creations, their family’s future is perhaps their best design of all. Find out more about IBA’s Indigenous Home Ownership program and Business Development and Assistance Program. Meet our CEO, Chris Fry. Nurturing its business relationship network has taken Outback Global... well, global. The business partnership putting people first. 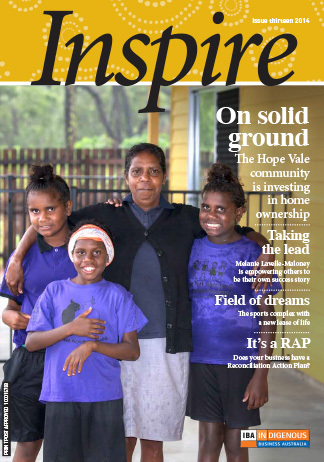 Whilst precautions have been taken to ensure that the information within this edition of Inspire Magazine is accurate, Indigenous Business Australia (IBA) does not give any guarantee, undertaking or warranty concerning the accuracy, completeness or currency of the information, and does not accept responsibility for any damages or losses suffered by you from relying on the information in this publication. IBA invites you to seek professional advice to verify the accuracy and currency of the information within this publication to ensure that the information is relevant to your personal circumstances. The information provided within the publication is of a general nature. The information is not tailored to your individual needs or circumstances. Your circumstances may be different to the examples provided, and this will reflect a change in services provided by IBA. If you are eligible and decide to apply for financial assistance from IBA you should obtain independent financial and legal advice before acting on any information provided or signing any documentation. In some cases the publication may incorporate or summarise views, standards or recommendations of third parties. Such material is assembled in good faith, but does not necessarily reflect the considered views of IBA, or indicate a commitment to a particular course of action. The listing of a person or organisation in any part of this magazine in no way implies any form of endorsement of the products or services provided by that person or organisation. IBA respects Indigenous cultures and has taken all reasonable steps to ensure the contents of this publication do not offend Aboriginal and Torres Strait Islander peoples. In many areas of Indigenous Australia it is considered offensive to publish photographs or names of Aboriginal people who have recently died. Users are warned that this magazine may inadvertently contain such names or pictures.